Do you remember where you were when the first Harry Potter book was released? I was working as a primary school teacher in Guatemala at an International American School. My Spanish-speaking students learned to read in English just so that they could read Harry Potter and the Philosopher’s Stone. Imagine that. It was amazing to watch my students become so extremely motivated to read because they wanted to dive into the extraordinary world of Hogwarts. So, of course, I had to devour the Harry Potter books, as well, to be able to speak their language. 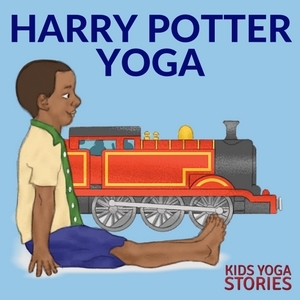 There’s something magical about introducing something new—like yoga—to children by using a theme that they love—like Harry Potter. 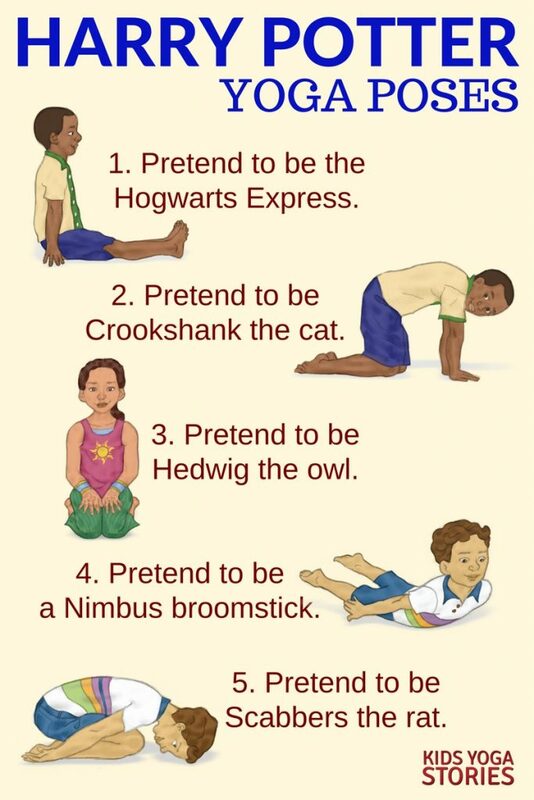 Today, Nik Haley shares with us a Harry Potter yoga sequence inspired by Kidding Around Yoga. Her yoga class students absolutely loved it! Try familiarizing yourself with the poses before reading the story, so that you can demonstrate the pose after reading the prompt aloud. 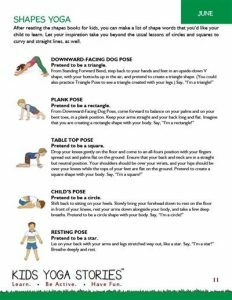 You can find pose instructions on our list of Yoga Poses for Kids page. “Here comes Crookshank the cat.” (Cat Pose – Pretend to be a cat). “Now, imagine you are a Nimbus 2000 broomstick.” (Come to your belly in Locust Pose – Pretend to be a broomstick). Optional: Finish the class in a guided meditation of your choice. You could ask the children to think what it would be like to be Harry Potter, living at Hogwarts. Nik Haley is a qualified teaching assistant and children’s yoga teacher, who is currently taking her adult yoga training. She teaches kids yoga classes at her local studio and schools. She enjoys using stories in her yoga classes and expands on the story concepts with games, motor skills activities, props, and partner work. Find Nik on her Facebook page here. 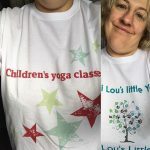 Looking for More Kids Yoga Class Ideas? Fun and simple themes with monthly yoga poses and kids books recommendations! 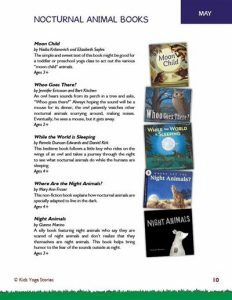 To spark your imagination, each monthly theme includes five yoga poses for kids and five recommended children’s books. 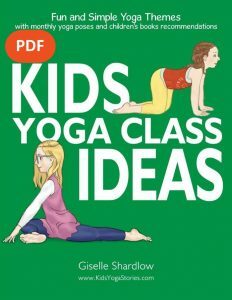 This 31-page eBook is for teachers, parents, kids yoga teachers, caregivers, and health practitioners looking for simple, convenient ways to add yoga into your curriculum, classes, or home life. Age group: Toddlers to Early Primary, ages 3 to 8. 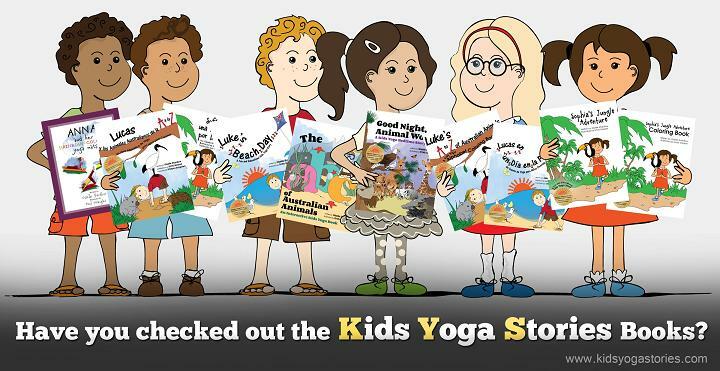 Purchase your Kids Yoga Class Ideas PDF Download here. My girls love Harry Potter! I’m excited to do this sequence with them. Thank you for sharing! Great sequence – I found that there is an actual adult pose called Owl Pose, which I suggest is a good substitute for the Easy Twist used to represent Hedwig. Going to get some pom poms to play toe-ga in my kids yoga classes this week. Thanks!